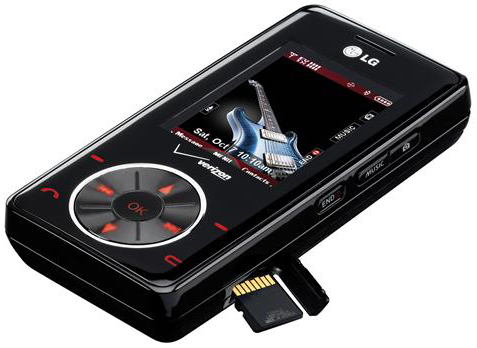 If you are looking for a decent phone with features such as a camera, bluetooth, music playback, microSD expansion, and navigator, the LG Chocolate (aka VX8500) is a great phone. The VX8500 has become quite popular over the last six months since many are purchasing it as a multi-functioning replacement for their iPod. The phone usually retails about $500 without any service and still costs over $99 with a new contract from Verizon Wireless stores. Amazon.com has pretty neat deal in which the phone’s final cost will be FREE after signing a new service contract and submitting a mail-in-rebate, which are usually trustworthy. We do however feel that Verizon will be throwing out this phone in the coming months, so we don’t recommend purchasing this phone if you are some one who always wants the latest gadgets. We recently took a look at other phones, which we liked much better, such as the VX8600 (looks similar to the Chocolate, except in the form of a flip-phone) and the LG VX9900 (aka enV). Amazon.com is also offering large rebates on phones such as the LG enV and Motorola KRZR, which both will only cost $50 with a new service plan. No clue how long these offers will last so don’t wait if you want one. I really want a phone like this for a really long time. How do you turn off the Voice Command feature on the Chocolate?